Ack! I forgot Poll Saturday! The last few days have been a little busy. There’s work, as usual. Then there was cleaning the house for the impending maternal visit (she lands in a few hours). Then, because life wasn’t interesting or busy enough, there was the Friday afternoon spent chasing down an escaped parrot. That was hair-raising. Imagine a cage door somehow not as shut as it seemed (and we’re quite careful), and a French door open to outside. Imagine four dogs, one of whom is deaf and old and doesn’t care much but three of whom are quite happy at the idea of chasing squawking, flapping, screaming, one-bite-fits-all small parrots. All in all we’re lucky only one of the 2 parrots got out. Cue 3 hours of alternate deep depression, heart-stopping hope, self-flagellating guilt and remorseful relief. Yes, we got him back. 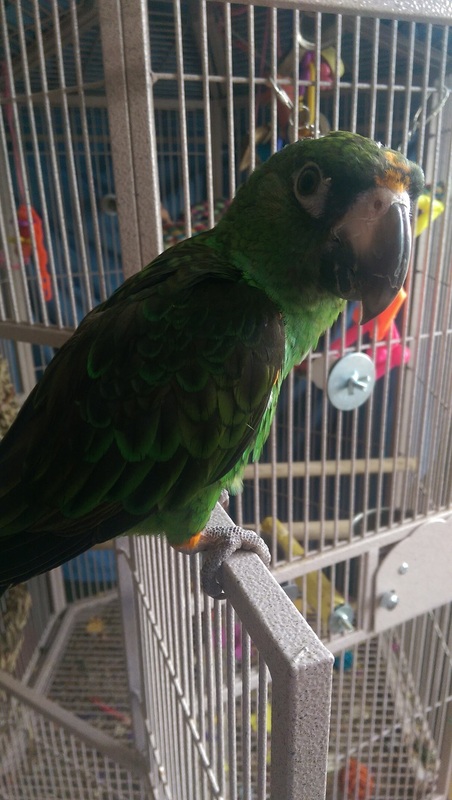 Turns out most “how to catch your escaped parrot” websites are right: a tame parrot that can fly won’t usually go very far, and will usually stay put once they find a relatively safe spot to sit. The little bugger didn’t answer any of our calls, but it turns out he was about 20′ from the back door (and 20′ up in a tree) while we were freaking out calling him. Eventually he got hungry, and mostly he got jealous of the fact that the other parrot was being fed yum-yums (seeds and nuts) and was making a lot of noise about enjoying them. He tried to fly down, failed, landed on a branch within reach and was very happy to get on my hand and go back into the house. Whew. * See Mr. Izzard, French lessons, and monkeys, passim.